Zayde Naquib is the Founder of Bar Nine, a coffee roaster and café that has been serving Los Angeles and beyond since April 2014. Zayde has been working in coffee for 10 years, switching careers from post-production in the film and video industry. His love for hospitality and craft led him down several roads in coffee, from work behind the bar to roasting to baking, managing teams, and helping develop training programs for various cafés across Los Angeles. 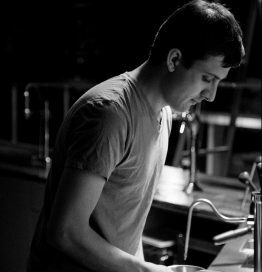 Throughout his career he started to develop ideas for a café and roastery, wanting to find ways to elevate the experience for the guest and the barista. He formed Bar Nine with entrepreneur Jereme Pitts in 2013, and within a few months found an old warehouse in Culver City, which they meticulously cleaned up and built out their vision. Bar Nine is known for their café experience, a vibrant home coffee subscription, and several ways they try to “do business better,” most notably with a Hospitality-Included model that removes tips from service and guarantees a higher base wage for their team, and with their commitment to sustainability through an all-glass takeaway program and use of solar power.